"One is reminded of the beautiful summer days of 1944, when tens of thousands of Jews were forcibly marched to their deaths through the streets of Budapest." Hungarian, Romanian, Serbian and Czech. 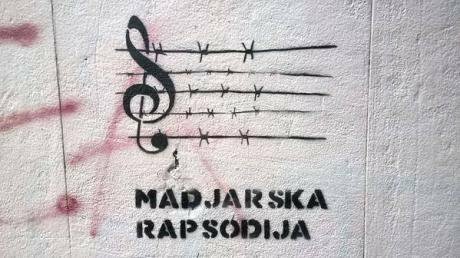 Graffiti (from Serbia or Croatia). Dragana Obradovic/The Balkanist. All rights reserved.I am not qualified to write about the crisis which sends Syrians, Afghans, Iraqis, Eritreans and others to Europe. I know only what I read in the newspapers and in a few specialist books. But I have something to say about the crisis in which central and eastern Europe is plunged all of a sudden. This is not going to be especially entertaining. The situation is too serious for that. I am not in a mood to be wittily sardonic or particularly original about it. Brutal openness is called for. The story begins, of course, in 1989. ‘Real socialism’ – of which I was an opponent – imploded. What seemed a triumph for my generation of dissidents, was something else for the majority of the population. With the benefit of hindsight, it seems that not many people bothered to understand – except in constitutional terms: civil liberties and such – the system which we were so happy to see collapsing. Eastern Europe needed a revolution and a revolutionary tyranny in order to create – at an exorbitant price – an urban and industrial civilization in order to end a millennium or so of agrarian backwardness and personal servitude. Regarded from a Tocquevillean vantage point, ‘real socialism’ has merely finished the job of Habsburg and Romanov absolutism that started a modernist – that is, capitalist – development based on two sources: state investment and foreign (western) loans. Vienna, Hamburg and Paris banks had been behind the spread of manufacturing and the state supplied the infrastructure (railways, harbours, postal services, a modicum of elementary education, policing, a semblance of public order). This has not changed since the eighteenth century. After a prolonged period of autarky under Stalin, this formula has reasserted itself. The East European countries, under the cloak of the ‘cold war’ had been, from the 1960s, deeply indebted to the west. The régime had become profoundly conservative and increasingly nationalistic. You might believe that the main enemy was – at least ideologically – western capitalism, but no. The main enemy was (and remained) 1968 and the New Left which might have reminded people of socialism, buried by then under a second-rate consumerism. The official press ridiculed the civil rights movement in the United States. In the popular comedy programme of the state radio the phrase ‘…and over there, they beat the Negroes’, was greeted by loud audience guffaws. The idol of the state intelligentsia was not Marx, but Max Weber. Any objection to scepticism and relativism – such as asserting the value of revolt – was considered (not only by officialdom, but by middle-class opinion) ‘Bolshevik fanaticism’. Modern conservatism is not dogmatic, but sceptical. Prejudice was (and is) celebrated as tradition and spontaneity, theory was rejected as the weapon of dictatorship, hostile to a plurality of views and of genuine expressions of the national soul. A conservatism that was not different from fin-de-siècle Vienna’s individualistic pessimism, was (and still is) dominant. Until the 1970s, the supremacy of the state, propped up by foreign capital, resulted in profound changes, made possible by the obliteration of a very small capitalist sector between 1920 and 1925 in the Soviet Union and between 1945 and 1948 in the newly acquired territories and mostly by a newly built, huge modern economy. The main social reality of old Eastern Europe – the large landed estates still owned by the aristocracy and by the Church, together with the abject misery of peasants – has disappeared without trace. These are urban societies, where most people, former peasants, later industrial workers, now ‘just people’, live in the enormous high-rise settlements constructed from the same blueprint everywhere from Shanghai to Ljubljana and Prague. They live there still, only the factories are closed down, and people are mostly unemployed or pensioners. The whiff of defeat is unmistakable. The remaining lucrative chunks of the state economy have been ‘privatised’, that is, simply handed over to politically well-connected oligarchs. The present prime minister of Hungary, a penniless student in 1989, is now the head of a vast mining, constructions and agrarian conglomerate, run by family members and political flunkeys. His predecessor and arch-rival, a poor young man at the time, too, is also a billionaire many times over. They have no business experience or business acumen, their fortune is a donation from a grateful nation. But most of the erstwhile state economy is a ruin, a rusting hulk of vast nothingness. Apart from the oligarchs, indistinguishable from the state, whatever activity can be noticed in these countries at all, is funded by foreign capital, foreign loans and foreign aid. Like a hundred years ago, the fierce nationalistic desire for independence is used by forces that would not dream of realising it, as they would not survive a single week without being totally dependent. A combination of resentment and hypocrisy motivates the policies the results of which you can see on your screens. How can such a society be held together? There are here, too, large cities where urban sophisticates have the same concerns as people in London, New York, Boston, Paris or Oslo. And rural pockets where 4 of our 9 million inhabitants live in utter dejection. Now it is, naturally, racism. How could you otherwise make people vote for the dismantling of the few remaining elements of social services and social assistance? How could cross-class solidarity (if you wish: ‘national unity’) be fostered? How would it be possible to convince the poor that an unprecedented inequality is in their own interest? Obviously, by presenting unemployment and social assistance as something pertaining to ethnic minorities – in eastern Europe the Roma, in central and western Europe the Turkish, Kurdish, Arab and African immigrants, in North America blacks and Hispanics – so, in the popular imagination, wealth redistribution appears as a favour to ‘foreign’ people. Liberals, unwittingly, contribute to this major political fraud by conceiving of the social question as a problem of ethnic or racial discrimination (which, of course, exists) and a problem of rights. Human rights groups and NGOs are the most hated ‘institutions’ in eastern Europe, according to opinion polls, especially among workers, because they are believed to have a bias against ‘us’ (and are financed by who else but ‘world Jewry’, called in the conservative Hungarian press, politely, ‘the global shadow power’). Hiding the reality and the importance of class in capitalism has always been the central element of all establishment ideology. (I wonder how many of the readers of Klassekampen take the class struggle in its title seriously.) In the recent past, the primary political community supposed to transcend and supersede class was the civic nation bound in loyalty to the King and to the legitimate institutions of the state, with a peculiar stress on the Army and on the State Church. Now it is not the nation of all loyal subjects or citizens which is the focus, but the ethnic, racial and cultural or language majority in a given state (this is what I call ‘ethnicism’ – in contrast to the nationalism of the past – in my theoretical writings). The main political identity is white, ‘Aryan’, male and heterosexual. In spite of what liberals and socialists might think or say. The only great historical competitor of both nationalism and racism has been class, as defined by the international workers’ movement – in this respect (and no other) the world historical heir to Christianity. In the absence of international socialism as the decisive political challenger to the present order and with the hollowing out of any effective idea of a civic nation and of a ‘constitutional patriotism’ propped up by the welfare state in the first two thirds of the twentieth century, the strongest political feeling is that of ethnicity and its defense. Both the threat from below (the ‘coloured’ of one kind or another) and from above (international finance, the American Empire or what have you), both from outside (migrants) and from inside (disloyal minorities bent on destroying ‘us’ or on destroying our ‘normal’ sexuality like the LGBTQ people) are felt to endanger identities that were once thought to be sub-political if that. The massive influx of refugees from the Middle East, Central Asia and Africa to Central and Western Europe has thrown the continent into disarray. Both the incompetent, ignorant and badly paid repressive state apparatuses in Greece, Macedonia, Serbia and Hungary and the well-organised, shipshape, rich bureaucracies of Austria and Germany proved unequal to the task. With the exception of Hungary, they are hesitating between ‘Kantian’ egalitarianism and universalism and downright ethnicism, between humanity and cruelty. As always, purposefulness and determination wins. The only European statesman to know his own mind is the Hungarian prime minister, Viktor Orbán, whose ascendancy is one of the greatest disasters of Hungarian history. Mr Orbán is triumphant. His policy of zero immigration and of barbed-wire border fences wins. Border controls are now being imposed by Austria and Germany, where the governments are changing their stance by the hour. You can say that he is hypocritical – the Hungarian government has authorised a mysterious offshore company to officially sell Hungarian citizenship to wealthy foreigners for twenty thousand euros; most flats in my building in central Budapest are owned by foreigners; you are greeted in shops and cafés in my neibourhood in English as ethnic Hungarians are a tiny minority in the streets surrounding the Hungarian Parliament; American, Indian, Scandinavian, Japanese and Italian yuppies are the rule rather than the exception around here; Budapest, Prague and Zagreb are groaning under the weight of unbearable crowds of western tourists – but then nationalism has always been ambiguous and insincere and the new ethnicism is no different. What needs to be understood is that there is such a thing as competitive immigration. East European countries could not survive without the emigration of their superfluous workforce to western Europe. A few years ago, the population of Romania was 23 million, now it is 18 million. In the last two years, 600 thousand Hungarians (of a population of 9 million) have left the country for Britain and Germany, mostly young skilled workers and university graduates. (There is an alarming dearth of doctors and nurses.) If they would be replaced by Muslim (and eastern Christian) refugees, that would mean an economic disaster as the aging east European populations – with a collapsing pensions and health system – cannot hope to make ends meet without remittance money from their grandchildren in the west. It is the vital interest of countries such as Hungary to stop the refugees while we are competing with them for western resources, for the domestic economy of Eastern Europe is a sad joke. Not only are people like Mr Orbán or the Slovak and Czech prime minister, Messrs Robert Fico and Bohuslav Sobotka unwilling to accept refugees – who are fed and clothed only by admirable and exhausted volunteers from their own depleted pockets – but they want to make sure that ‘our’ emigrants win the contest, easing thereby the burden on our barely existing social budget wherein unemployment benefit is available only to those who would enrol in obligatory public work (the wage is around €150 per month) organised and supervised by the Hungarian national police. That this is explained by wanting to preserve our so-called Western Christian heritage and to save Europe from committing a cultural suicide – and that this is, alas, believed by many people and it helps to mobilise support for the Right even by people whose elementary self-interest runs counter its policies – may sound ridiculous, but it isn’t. Ever since 1989, interpreted as the definitive end of the Enlightenment project, it is deemed impossible to deploy a moral criticism of politics, such criticism held in our anti-philosophical, romantic-reactionary cultures to be horribly Kantian and Marxist. The assertion of crude self-interest is sufficient to justify the evil legislation (making immigration a crime) and the state of exception (Notstand, état d’urgence) declared by the Hungarian government. (This is ably described by Kim Lane Scheppele in Politico.) Denying the human rights of refugees – this contravenes Hungarian and international law, but no matter – , fencing off the Serbian and Romanian (and possibly the Croatian) border, corrupting the court system by forcing it to issue automatic rejection writs of asylum requests on a conveyor belt, denying explicitly the right of the petitioners to have these decisions translated in any language from the Hungarian has elicited some protests, chiefly from liberal lawyers and a handful of social scientists, but the bulk of public opinion is silent. There is some commiseration for the poor refugees and their small children, but almost nobody is prepared to welcome any of them amongst us. The justified and reasonable indignation of the Serbian and Romanian governments – far more tolerant and democratic than the richer Central Europeans, the so-called Visegrád countries – is ridiculed or, at best, ignored. World-famous luminaries such as Imre Kertész and György Konrád are more or less cautiously supporting the fake anti-Islamic hysteria whipped up by the Right. So do other respected pillars of society. The anti-Semitic and the philo-Semitic Right will finally be able to announce solemnly a merger.The moral atmosphere is irremediably polluted. One is reminded of the beautiful summer days of 1944, when tens of thousands of Jews were forcibly marched to their deaths through the streets of Budapest – and the cinemas were playing musical comedies, theatres staged merry operettas, good, clean fun was had in cabarets and night clubs and people turned to the sports pages, bored with war news. Music wafted from the open-air restaurants and cafés on the bords of the Danube, just like now. Men are admiring pretty young women in their scanty summer dresses and short shorts, there are poetry readings in fashionably run-down beer gardens. The end of the world would be scarcely noticed or it would be shrugged off as of no consequence whatsoever. This article was originally published by the Norwegian journal, Klassekampen, on September 19, 2015. You can also read this article in Hungarian, Romanian, Serbian and Czech.